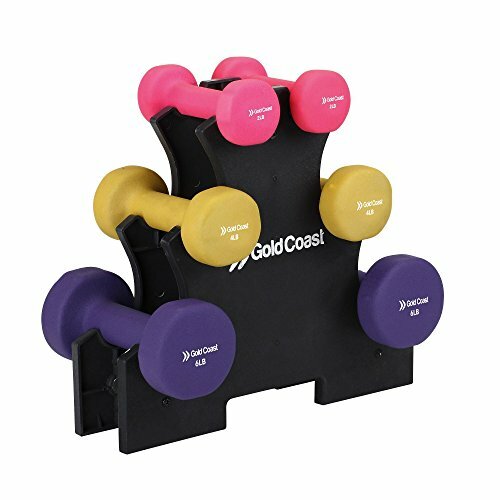 Take training to the max with a little help from the Gold Coast 24lb Dumbbell Set and Stand. Ideal for a range of exercises including power walking, aerobics, yoga, Pilates and general muscle toning and conditioning. Use on a weight bench, stability ball, wobble cushion or on the floor. Great for home gym and studio workouts as well as rehabilitation and physiotherapy. Coated with anti- slip, soft touch neoprene for a firm and comfortable grip. Colored by size for easy identification. Portable, freestanding pyramid-style stand allows you to store the dumbbells safely and conveniently when they're not in use. Ideal for beginners and professionals of all ages and fitness levels. If you have any questions about this product by Gold Coast, contact us by completing and submitting the form below. If you are looking for a specif part number, please include it with your message.